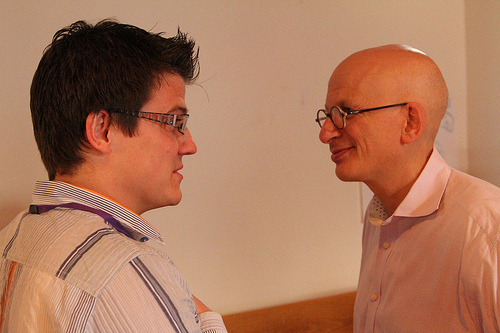 It has taken me almost a week to decompress from the session with Seth Godin I wrote about last week. I haven't been procrastinating, just overwhelmed. The three days were full of Seth's stories; vivid, succinct, entertaining, and persuasive. The aggregate of his ideas hit me hard, in my stomach, like a swinging wrecking ball of change. Though I'm still reeling, I feel inspired to share at least a few points that are sticking. If they seem but partly formed, it's because they are. We move and accelerate with linear momentum, which makes it very hard for us to turn. In fact, the more momentum we have, the more difficult it is. There is a revolution going on right now that is changing our economy and changing our lives; the connection revolution. This revolution won't last forever, maybe 15 years, and it will be marked by notions of flipping scarcity and abundance. Any task worth doing, or innovation to be made, pulls from three sides of a triangle. Seth described that you first need a strategy; a plan, or methodology. Second, you need the skills to execute. Third, and most importantly, you need to care so much about your goal that you are willing to fail at it. A hefty portion of time was spent navigating through our preponderance of fear, and the excuses we use to convince ourselves from caring enough. I'm going to apply more of my skills to the things that deeply interest me, things that I am more likely to care a lot about. Often times, as an industry collective, or as individuals, we are afraid to destroy what is perfect in order to enable what is possible. The ship-it point is the moment in time when a project is finished and it released it out into the world. Seth offered a persuasive plan that gets serious about shipping. The process of writing down your goals, and documenting your daily progress is not enough. It requires a thoughtful step by step analysis of all the factors that might get in the way. I'm going to work harder next year in going through this process, writing out my expectations by hand, and documenting my progress toward acheiving them. I will ship more in 2012. The food at meetings and conferences is usually not memorable, but the lunch on the last day was different. He brought in "the best thai food in New York"—one item was a best selling item not even listed on the menu. "Don't throw the plastic bowls away," he shouted to the group over lunch, "I'll be taking them home to wash and return them." Well, I made sure to eat every last morsel in my bowl, not only because it was delicious, but I couldn't stand the thought of Seth having to scrape my bowl clean in his kitchen sink! That was just one of the many small gestures, that were remarkable, and it was heartwarming. And another thing that sticks, were the nametags that he printed up. My first name is printed in large bold font, and in parentheses undernearth, I dare you.